This bright yellow to orangish yellow waxy cap has a sticky, convex to flat cap. The stem is also yellow, and its surface is smooth. 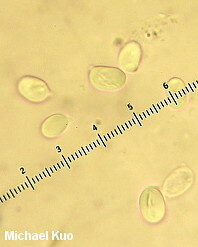 Under the microscope, its spores are ellipsoid and generally shorter than 10 µ. 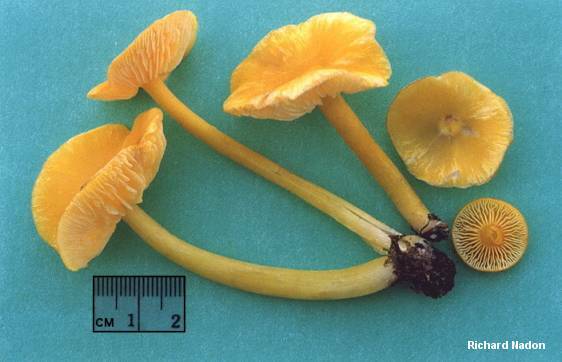 Similar species usually differ on one or more of these characters; Hygrocybe acutoconica, for example, has a pointed cap, a fibrillose stem, and ellipsoid to subcylindric spores that are longer than 10 µ. It is possible that the classic European species Hygrocybe chlorophana is the same as the North American species described and illustrated here (and, if it is the same, Hygrocybe chlorophana would be the preferred name since it was coined more than 100 years earlier). 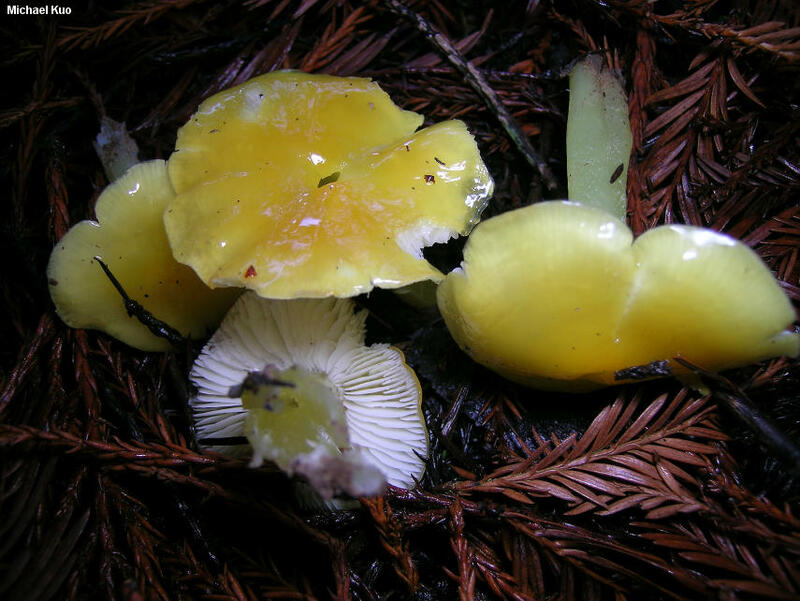 Traditionally the two species have been separated on the basis of the stickiness of the stem surface, with Hygrocybe flavescens having a sticky stem and Hygrocybe chlorophana having a dry or merely moist stem, with mycologists on both continents using both species names. However, stem stickiness is a variable and unreliable character, and some mycologists have argued that the two species are actually the same. 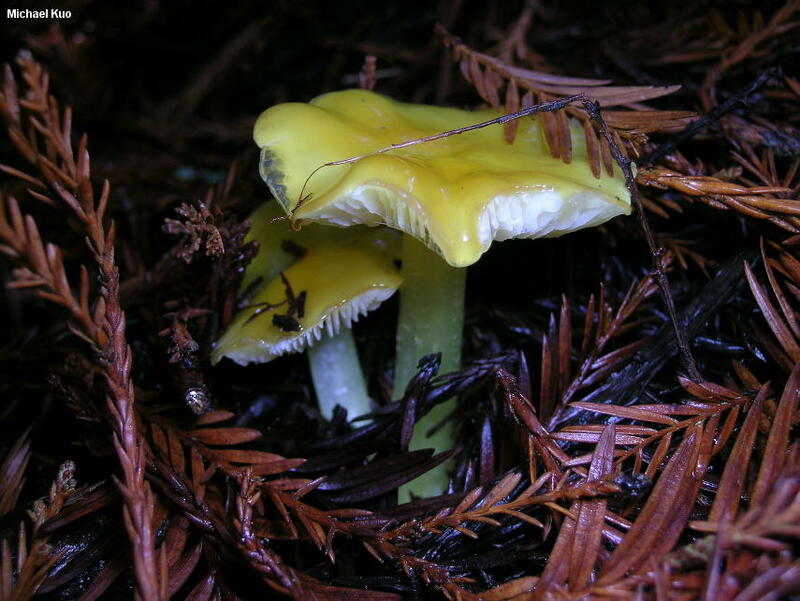 Recently, a DNA study (Lodge and collaborators, 2013) demonstrated clear phylogenetic separation between a North Carolina collection identified as Hygrocybe flavescens and a Danish collection of Hygrocybe chlorophana. 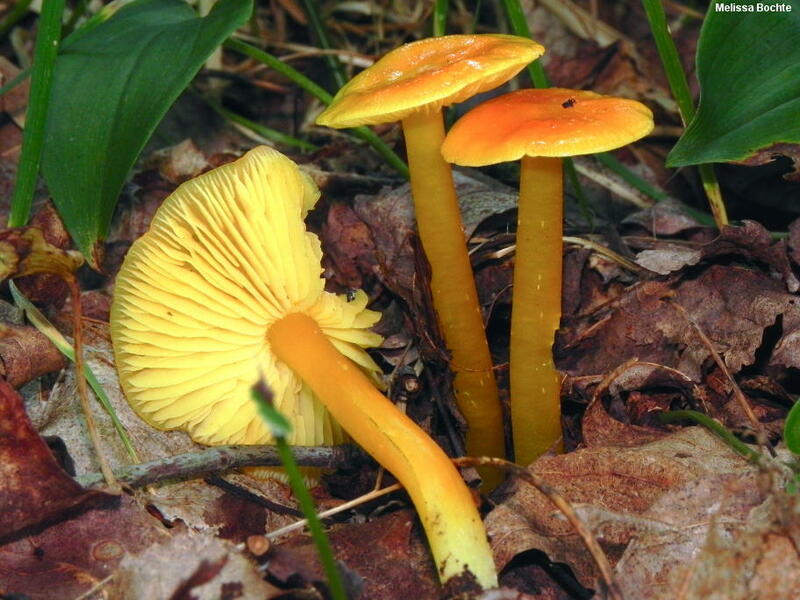 The question is whether the North Carolina collection actually represents Hygrocybe flavescens as it was originally conceived by Charles Kauffman in Michigan; further study is required. 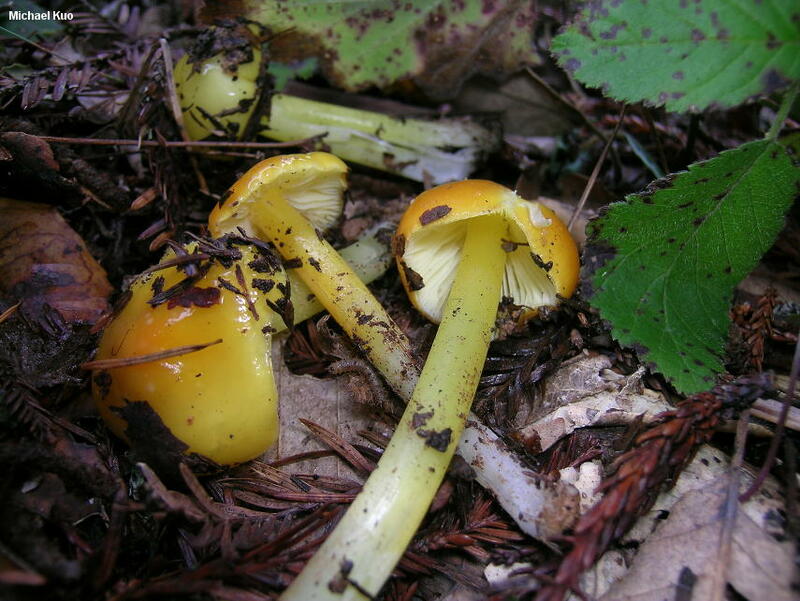 Hygrocybe parvula is a similar but smaller species; its stem is usually pinkish red, contrasting with the yellow cap color. Hygrophorus flavescens is a synonym. Ecology: Precise ecological role uncertain (see Lodge and collaborators, 2013); appearing in woods under hardwoods or conifers; frequently--but not exclusively--found under coast redwood on the West Coast and under beech in eastern North America; growing scattered or gregariously; spring through fall, or in winter in warmer climates; apparently widely distributed in North America. The described and illustrated collections are from California, Pennsylvania, and Québec. Cap: 2-4.5 cm; convex, expanding to broadly convex or nearly flat; slimy when fresh; fragile; bald; lemon yellow, aging to orangish yellow--or sometimes more orangish centrally and bright yellow marginally; the margin not lined. 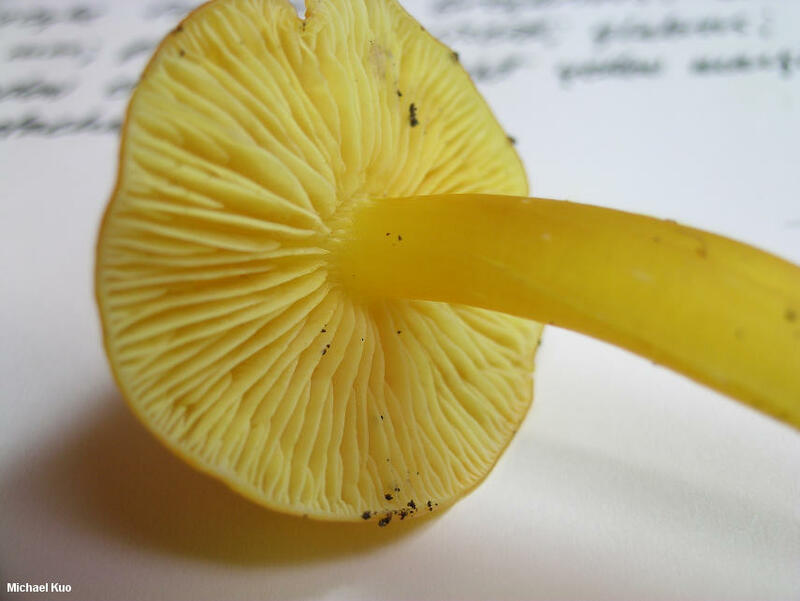 Gills: Narrowly attached to the stem, or attached by a notch; close or nearly distant; at first nearly whitish, but soon pale yellow; short-gills frequent. Stem: 4-10 cm long; 1-2 cm thick; equal or slightly tapering to base; dry or greasy (especially on handling) but not slimy; bald; bright yellow, fading somewhat; fragile and easily splitting; white at the base. Microscopic Features: Spores 7-10 x 4.5-6 µ; smooth; ellipsoid; only rarely constricted; hyaline in KOH; inamyloid. Basidia to 40 µ long; 2- and 4-sterigmate. Hymenial cystidia absent. Lamellar trama parallel. Pileipellis an ixotrichoderm. REFERENCES: (Kauffman, 1906) Singer, 1951. (Hesler and Smith, 1963; Bird & Grund, 1979; Largent, 1985; Arora, 1986; Phillips, 1991/2005; Lincoff, 1992; Barron, 1999; Boertmann, 2000; Roody, 2003; McNeil, 2006; Miller & Miller, 2006; Trudell & Ammirati, 2009; Lodge et al., 2013.) Herb. Kuo 01130512, 01151105, 07221409.